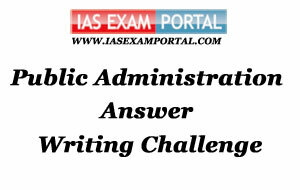 Weekly Mains Exam 2016 Answer Writing Challenge - Public Administration "MODULE- 56" | IAS EXAM PORTAL - India's Largest Community for UPSC Exam Aspirants. Weekly Mains Exam 2016 Answer Writing Challenge - Public Administration "MODULE- 56"
Public Administration- Paper I "Syllabus Topic – Public Policy: State Theories & Public Policy"
Q1. Discuss the various state theories with its public policy. Indian Administration- Paper II "Syllabus Topic – Union Government and Administration: Ministries and Departments"
Q2. Discuss the organization and changing role of the Home Ministry of Government of India.